Fill Rate: Approx. 15-18 Fills/Min. 1. Connect a compressed air line to the filter at the back of the unit. Regulate the incoming air to a pressure of approx. 35-40 PSI. 2. Open the two-way air valve on the console. Compressed air flows thru an internal vacuum transducer to create suction within the filling gun. You are now ready to pick-up powdered product. 3.Dip the gun into the product trough. Powder is instantly picked up into the barrel at a controlled even density. 4. Doctor-off any excess product left at the tip of the filling gun. 5.Insert the gun tip to the mouth of the container to be filled. Depress the footswitch, Vacuum changes to gentle pressure, dispensing a perfect, dust-free dose. 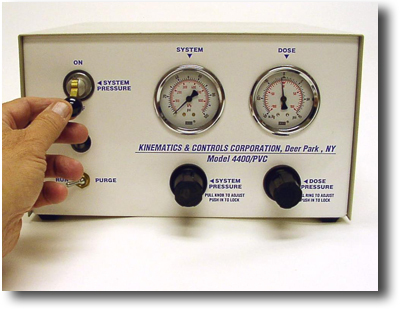 Kinematics & Controls Corporation invites all perspective and/or current customers to submit one or more product samples to us for a free performance evaluation in our filling equipment lab. A sufficient quantity of product to perform the evaluation. Minimum amount should be approximately one liter. For small fills a minimum of one half liter may be sufficient. One or two sample containers of each type used, or drawings of them showing the overall dimensions and mouth opening. Material Safety Data Sheets for each product submitted for evaluation. Try before you Buy! We don’t want you to buy our equipment if it’s not going to do the job you need it to do. We encourage you to actually use our equipment in your facility without obligation for 30 days before you buy it! What better proof of the pudding could there be? After we have completed an initial performance evaluation of your product in our laboratory, we will send you the machine of your choice to try for 30 days, without obligation. If, after this trial period, you are not 100% sold on the machine’s performance, just return it to us for full credit. No questions asked. All equipment described herein is warranted to the original purchaser for thirteen months from the date of purchase to be free from defects in materials and workmanship, but not against damages caused by misuse, abrasion, corrosion, negligence, accident, faulty installation, or by dispensing material incompatible with the equipment. When the equipment is installed and operated in accordance with factory recommendations and instructions, Kinematics & Controls Corporation will repair or replace free of charge, any part of the equipment found to be defective, upon prepaid return of the part to the factory during the warranty period. In no event shall any liability or obligation of Kinematics arising from this warranty exceed the purchase price of the equipment. All other warranties, whether expressed, implied or statutory such as warranties of merchantability or fitness for a particular purpose, are hereby excluded and disclaimed to the extent that they exceed the warranties expressly granted in this clause. In no event shall Kinematics be liable for consequential or incidental damages. Copyright © 2018 Kinematics & Controls Corporation. All rights reserved.